I wanted to give it a try and decided to go for python. My background is mainly Java and I expected python to be easy to learn. Find an interesting kata (Mars Rover) and create it in Cyber Dojo. I decided to go for one kata called Mars Rover because I thought it would be easy enough to learn a new language and at the same time challenging enough. 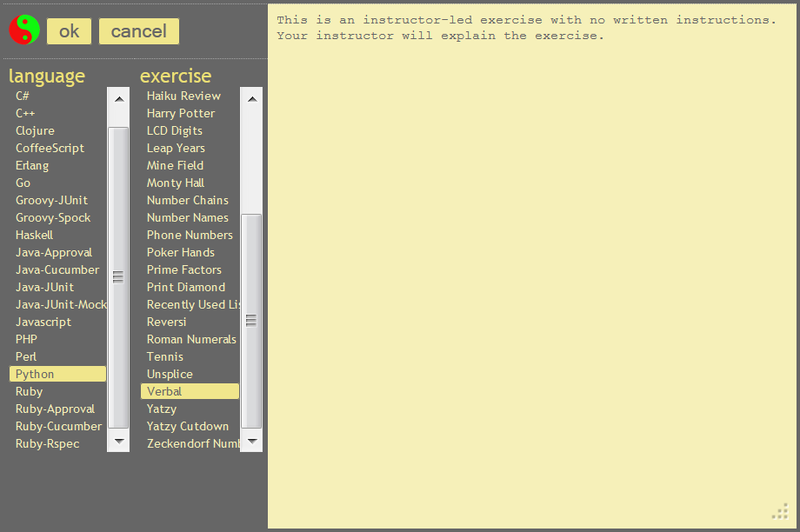 So, first of all, I connected to Cyber Dojo and created one new Kata by clicking the button Setup and then choosing the language Python and the exercise Verbal (this exercise, unlike others, starts with an empty instructions file that you can change by entering your own instructions). After clicking OK, this would give me a new ID that identifies all the Kata that I’ll be working on. Then clicked start. instructions: the instructions file that contains the requirements of the kata. – Develop an api that moves a rover around a grid. – You are given the initial starting point (x,y) of a rover and the direction (N,S,E,W) it is facing. – The rover receives a character array of commands. – Implement commands that move the rover forward/backward (f,b). – Implement commands that turn the rover left/right (l,r). – The only commands you can give the rover are f,b,l, and r.
– Implement obstacle detection before each move to a new square. If a given sequence of commands encounters an obstacle, the rover moves up to the last possible point and reports the obstacle. – Let’s say that the rover is located at 0,0 facing North on a 100×100 grid. – Given the command “ffrff” would put the rover at 2,2 facing East. If we check the output file, we’ll see that the test fails. Basically the Cyber Dojo platform always starts with a failing test. My first task is to fix it by changing the return value from the implementation class (untitled.py) to match the value expected in the assert (in test_untitled.py). return 54  # By changing it from the original 42 to 54 the test passes. Now, this is where I start learning python… but this time, I won’t be using any particular tutorial… I just want to experience with it a bit and what helps me the most is trying to find solutions for the challenges that I’ll be facing with the Kata. Once the first test passed, I focus on creating my own classes rover.py and test_rover.py (taking the existing untitled ones as a reference) to start implement the kata. Always practice following the TDD approach. First test, then implementation, finally refactor. What I’ll do next, is write tests for all the requirements following the previous steps. Every time I write a test, I’ll stop and modify the implementation to make the test pass. I won’t add the details for all the kata, but you can find it at the end of the exercise. In Python, a class constructor is the method that is named as __init__ and can accept several parameters. In order to define the Rover class and the parameters needed for it I decided to create this constructor. We can assign those parameters to object variables, but the variables will be accessible from outside the class as well, so there’s no need for getters and setters. Cyber dojo already comes by default with some testing framework for Python which is ‘unittest’. In order to make it work you just need to import the package unittest and make a class extend the class TestCase from that package. You can use several asserts to leverage unittest and most of them you can find them in the unittest link. For the Kata I started using assertEquals and moved to assertTrue or others as I was learning them. Basically each test is a method whose name start with the letters ‘test’. 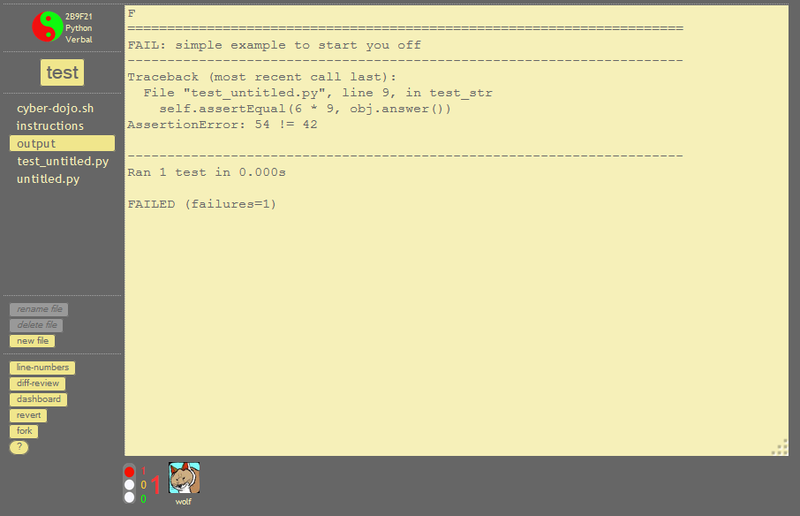 Here you have a couple of examples of tests that I created for the kata. # and the direction (N,S,E,W) it is facing. # Implement commands that move the rover forward/backward (f,b). Practicing with the kata I also had to learn how to raise, capture exceptions and read the exception message to compare it with the expected message value. In python, exceptions are raised easily, you just need to call raise Exception(message) with the message you want the exception to have like: raise Exception(‘Incorrect position’). As you can see, python doesn’t require to close the for or the if/elif. It works by indentation. I decided to practice a bit with arrays. There’s a requirement that says that planets are round and they have certain dimensions. Therefore one possible way to treat these dimensions is through an array of two positions. These arrays are defined by putting the values inside square brackets and then separated by commas. For example one planet with dimensions 10, 10 would be declared as: [10,10]. Later in the exercise, there was a need to define obstacles for the Rover. I assumed each obstacle would be defined as a position (e.g: [0,2]) and all the obstacles in a planet would be defined as an array of positions: [[0,2],[3,4],[5,5]]. This class would need to be passed to the Rover for it to know on which planet it was staying. Finally, I decided that I wanted to pass the Planet as one parameter of the constructor, therefore I needed two constructors. One without planet and one with planet. The one without planet I needed it for all the tests that were already passing before and did not require any planet. The one with planet was needed for all the tests with dimensions and obstacles. If you followed strict TDD and you created all the required tests for each of the requirements, then you probably ended with a much larger test_rover.py than rover.py (and definitely more than planet.py). The nice thing about TDD is that now you could do any refactoring and you would have the safety net that would help you verify that the functionality is still intact. Red representing a new written test that failed and green doing the implementation to make the test pass. In my case, I had many yellows representing compile errors and definitely more reds than I’d like to… but it always helped me to see where I was and allowed me to return to the last passed state easily. Cyber dojo helped me a lot to learn this new language. I cannot consider myself that I know python, but I’d probably feel comfortable reading some code after doing this exercise. Diff reviews: I could easily review any change between two different revisions and check what I had changed online. Revert: At any given time, I could revert to a previously known state. Fork: If I wanted to try something out, I could always fork the current branch and create another one to do my tests. Cyber dojo represents this with different animals. Download: And probably the last and more important for me, I could download all the work done and treat it offline with any Git client. I hope you liked this new approach of learning the very basics of a new language. In my case, I realized I am more interested when I need to deal with a specific challenge rather than looking at chapters in one tutorial. It helps me a lot to visually see if my tests are passing or failing and what do I need to do to fix them. And just go to google when I need to learn something new. It didn’t take me much time to do this exercise, probably around 3 hours, and by the end of it, I had the sense that I could start using Python to do some basic stuff. Also, the fact that those are not very long katas help me stay excited and motivated. I encourage you to try it out yourself if you’re interested in learning any new language or probably try Cyber Dojo when you have your next katas in group. I didn’t check it much, but there’s a Dashboard that shows the evolution from all the teams.